The sunny and bright skies along Kancamagus Highway gave way to cloudy and rainy weather for every day that I spent in Acadia National Park. As a result, heavy clouds and rain will affect most of the photos I will be posting about Acadia. 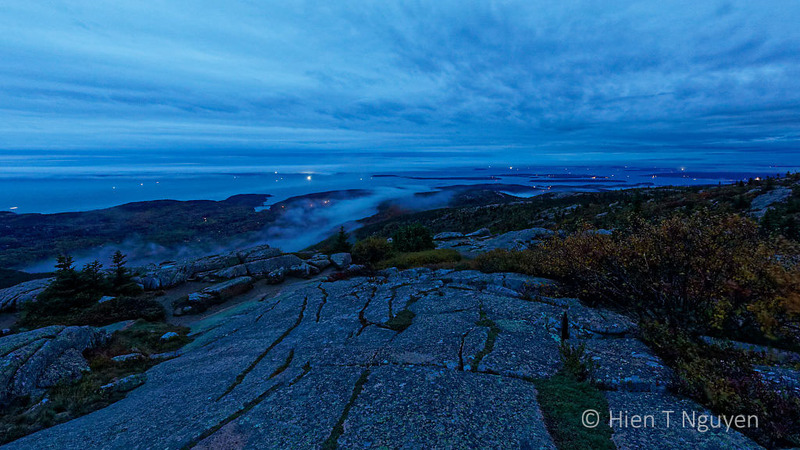 On the morning after arrival, I got up early and drove to the summit of Cadillac Mountain, 1530 feet (466 meters), the tallest point in Acadia, where one can see the sun rise the earliest in the Eastern United States. It was not raining, but the sky was completely covered with clouds. On top of Cadillac Mountain to see the sun rise. Other sun watchers also arrived, on foot or by car, then huddled together for warmth as they waited for the sun. 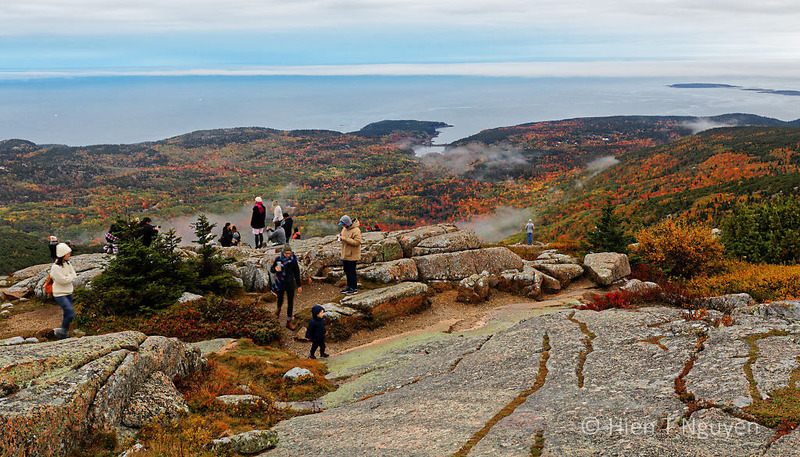 Sun watchers on Cadillac Mountain, Acadia National Park. People kept checking their watches or cell phones, but the scheduled time came and went, and the sun kept itself well hidden. There was gradually more light, but without the brilliance and warm colors of a rising sun. 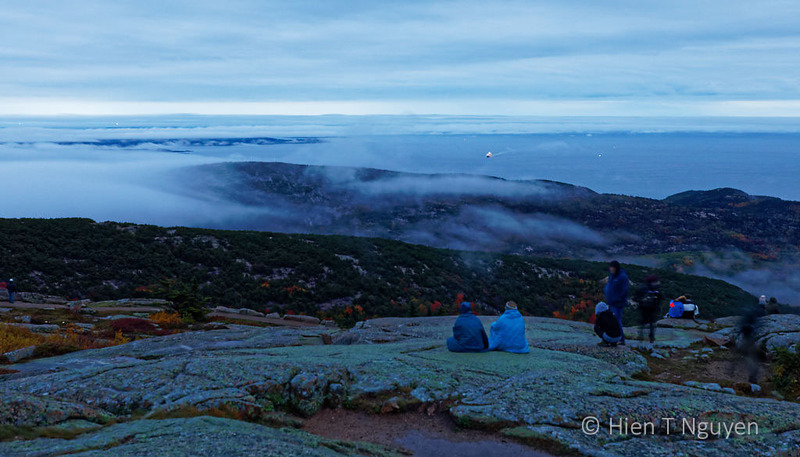 At the top of Cadillac Mountain with no sunrise. Disappointed people started to leave, either hiking down or driving their car to the town of Bar Harbor. The only indication of the presence of the sun behind those clouds was a sliver of pale blue horizon. Sun watchers leaving Cadillac Mountain. The following day, I also got up early to go do some hiking. 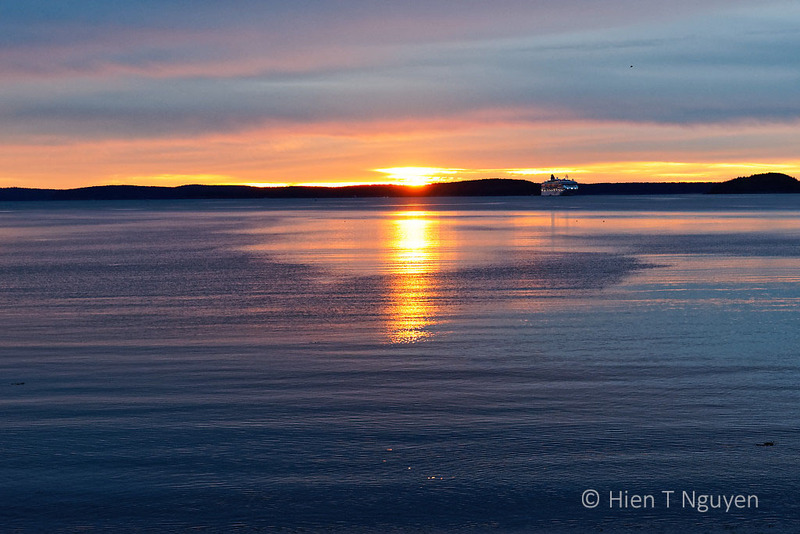 There was a superb sunrise as I drove by Hulls Cove, just before the entrance to Acadia. Here was the sunrise I wanted, and it was at sea level. I will always wonder what it would have been like if I had photographed it on top of Cadillac Mountain. Sunrise at Hulls Cove, Acadia National Park. On the right of the picture was a cruise ship anchored for the night. Sunrise at Hulls Cove, Acadia National Park, a minute after the above shot. I’m excited to see your captures from Maine and enjoyed these very much! 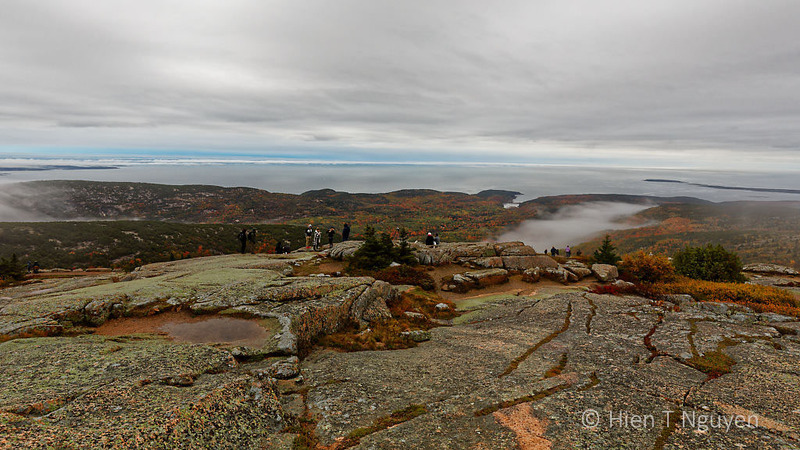 I hope to visit Acadia NP some day in the next few years! It’s an interesting and picturesque place. If you go, plan for the fall season. Finally, an actual sunrise after a day of waiting! 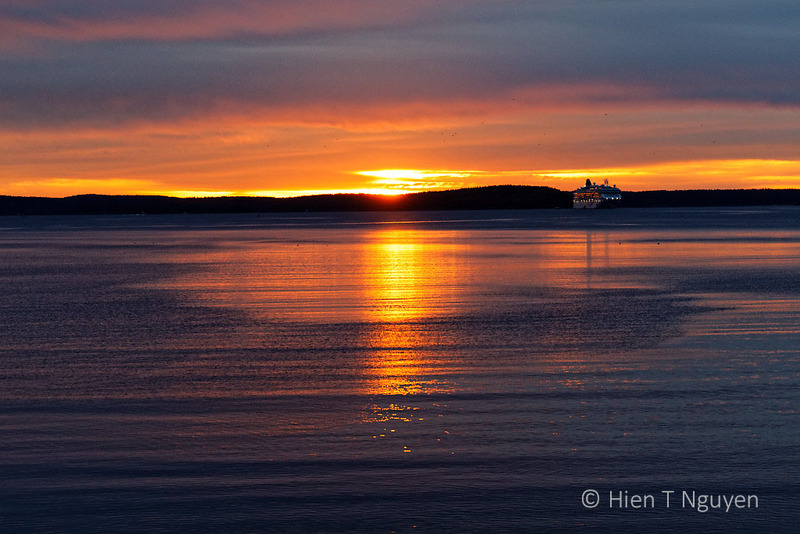 In the second photo, the light on the ocean is from a cruise ship sailing into Bar Harbor. It’s beutiful! I love sunrises! I’m sorry that the weather didn’t cooperate, but the images were still superb because of the view including the leaves in color and the hints of fog. The sunrise was also beautiful in its own way, I love a good sunrise from anywhere. That sunrise was a total surprise, and it only lasted for about 5 minutes, but gave me enough time to switch from the 100-400 mm to the 16-35 mm. Lovely photos. Such a shame that you had clouds and rain for a lot of the time. Makes these photos even more precious. You are right! Clouds and rain make the sunny days so much more welcome. Glorious start to the day! Indeed, the second day anyway. There are more photos to come! Thank you! Still more to come.